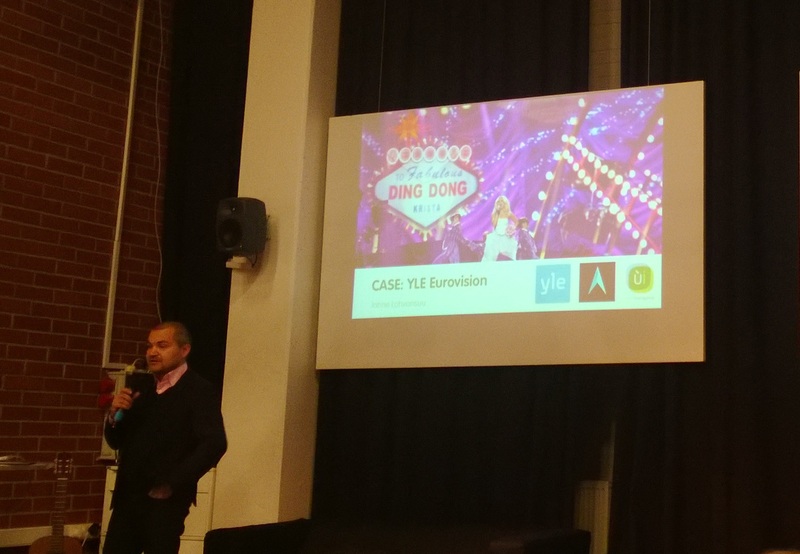 In yesterday’s Service Design Breakfast event at Startup Sauna, Janne Lohvansuu from User Intelligence has presented the case of live UX design in YLE’s Eurovision ambiance. User Intelligence have prototyped and tested new event page for YLE during the Eurovision 2013. Prototype was interactive, connected to live content during the events and tested by Eurovision enthusiasts. That way they have obtained crucial insights for the new service concept that intend to change the way we are watching TV. “We, user experience professionals have an awesome power to change user’s behavior with the help of technology” Janne said. Research shows that 86% of mobile internet users are using their devices while watching TV. This brings an opportunity to introduce second screen on mobile devices and engage users with the content related to TV program. YLE and User Intelligence got engaged to explore that opportunity. That’s how it all began. Applying service design, User Intelligence started from understanding the big picture – customer journey. It was about creating event hype stamina, from initial competitions through different events, culminating in Eurovision finals. After the big picture, they moved to details of the customer journey – what happens before, during and after each event. Having in mind different screen sizes of mobile devices, User Intelligence came up with event page concept. That was based on mapping of event’s time dimension (before, during, after) on different type of devices. Event page concept helped them to understand the change and to enter the cycle of rapid prototyping. For example, “before” page contained down counting ticking clock. “During” page had 2 tabs – one to watch TV show and another to watch next to TV content, like current ranking of songs. Depending on device, one or both tabs were present. 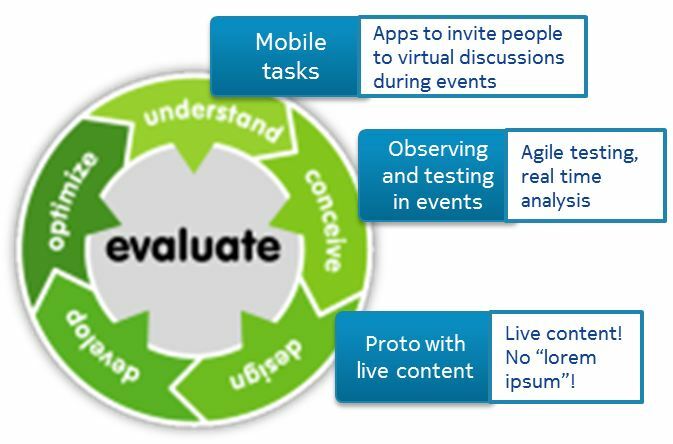 In-event testing was not done with ordinary, but extreme users – Eurovision fans. Their needs are quite the same as ordinary people have, just amplified and therefore easier to identify. Separate room was decorated to resemble home atmosphere, with sofa and multiple mobile devices scattered around – phones, tablets, and laptops. Users were freely using and changing device. For example, when following live content if they noticed their favorite is moving up, that produced more interest and made them change device looking for video content. Most useful were video clips. If they missed something they were able to find it. Design process – the wheel of UX with key additions. Interactive co-creation went on through multiple iterations, finally producing pages that scale both time vise and device vise. The result has met YLE’s expectation – meaningful concept of second screen and user engagement. As such, the outcome is seen as a significant step towards changing a paradigm how people are watching a TV.